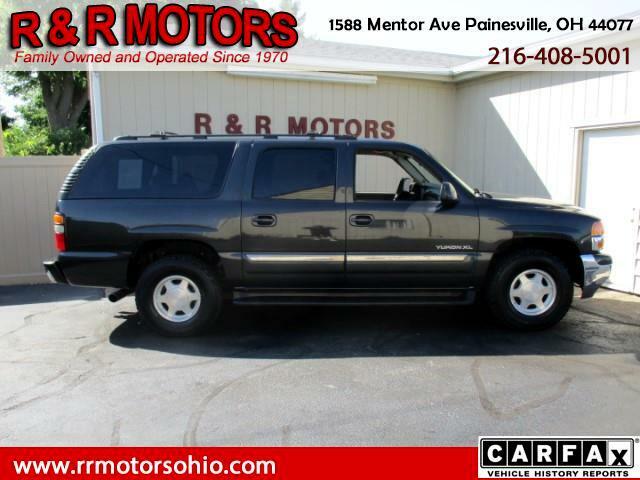 ***Well Equipped 8-Passenger, Runs & Drives Great W/ 4-Wheel Drive*** If you are in the market for an affordable, 8-Passenger Full Size SUV then this 2006 GMC Yukon XL SLE 1500 4WD would make an excellent choice. Since 1970, R&R Motors has offered our customers quality pre-owned vehicles at the same convenient location in Painesville, Ohio. All of our vehicles are offered with a complimentary Carfax Vehicle History Report and we are well known for our friendly staff and our LOW PRICES. We also offer Prime Bank Financing for well-qualified credit customers with Competitive interest rates and affordable payment options. Though we pride ourselves on providing detailed, accurate, and up to date information on all of our vehicles, both human and automated data entry errors can occur in the posting process. If you have any questions regarding one of our vehicles or would like to schedule a test drive, please contact us to confirm the vehicle's availability, price, condition, and optional equipment. Please note that Online payment calculators on our Company Website as well as 3rd Party Sites such as Autotrader or Cargurus are merely tools for the use of customers to estimate a monthly payment and should NOT be interpreted as an advertised monthly payment. Please also note that the loan term, interest rate and Down Payment used on these payment calculators are merely default settings and that interest rates, term length, down payment and monthly payment vary from vehicle to vehicle based on the vehicle's age, mileage and Price as well as the applicants credit score and income. Advertised prices may be subject to change to account for any service or reconditioning expenses incurred while the vehicle is in inventory. Please also note that Carfax Reports change daily and any vehicle descriptions referencing a Carfax may not reflect the most up to date information as reported to the Carfax database. Message: Thought you might be interested in this 2006 GMC Yukon XL.